This contains photos from our Canada trip accompanied by notes. There are a lot of photos, so you may wish to view this a bit at a time. It's broken into shorter topics, so that you can view as much or as little as you wish. In all cases, you can click on the small image to see it greatly enlarged. If your Internet connection speed is slow, you may wish to enlarge only the photos that particularly interest you. After you have done so, click your browser's Back button to return. This is from my (Larry's) perspective. The others probably have somewhat different impressions of the trip. Wanda, for example, thinks it had something to do with indexing! We left very early Wednesday morning. We drove to Omaha, parked in a commercial lot, and got shuttled to the airport. Had bagels and orange juice for breakfast, then went to our gate. 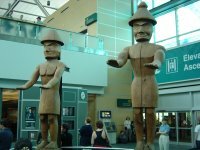 With typical air travel efficiency, Phoenix was on our route between Omaha and Vancouver. It was nice, though, because it took us over all our home grounds. 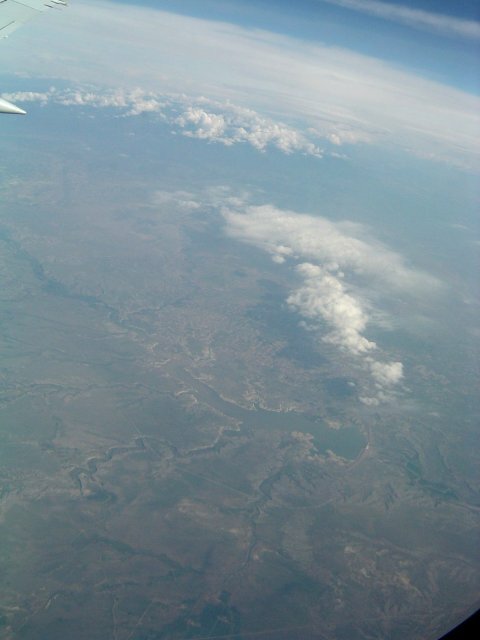 We flew back over Lincoln, then no doubt over Las Animas and La Junta, and here you can clearly see Pueblo Reservoir. A bit later, Alamosa was clearly discernable. Our connections were not bad, so we didn't have to spend too much time in airports. Our first plane was late getting into Phoenix, so we ran to the next gate only to find that the plane was delayed for mechanical troubles. One of the plane's two air conditioners was out. They didn't really get it fixed, but it was probably not an issue at 30000 feet. We did sit on the Phoenix tarmac for quite a while, awaiting our turn. On this flight, we were "treated" to an in-flight movie, "Shanghai Knights", with Jackie Chan. We did not rent headphones. It was our opinion that the movie was better without sound, anyway. Mom is always ready with travel advice, although 14-year-old Sallie has already far surpassed her parents in travel experience! Had a nice view of Seattle shortly before coming into Vancouver. Lots of water and islands. 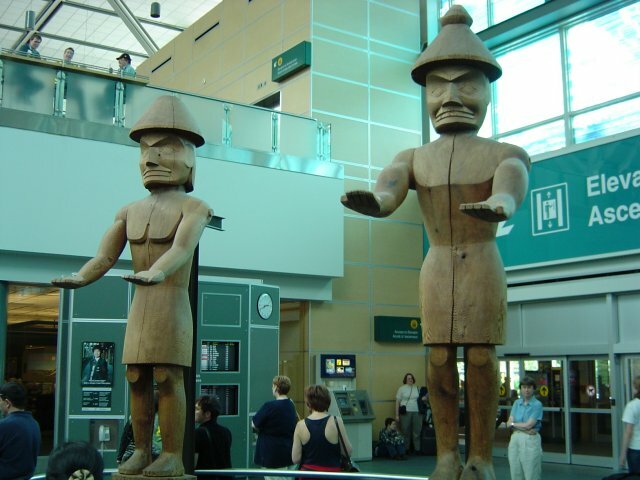 Here you see a shot of the Vancouver airport. Wanda and Elizabeth are way in the background.